This is Part III of a series dedicated to making the transition to Common Core State Standards and preparing for the Literacy component of the new PARCC assessment. Previous posts have focused on gaining familiarity with CCSS (Prepping for PARCC, Part I) and building understanding of sample assessment items (Prepping for PARCC, Part II). This final post in the series addresses specifically how we can strengthen planning and reflection capacities in our schools to examine whether our efforts to transition to CC SS and new assessment practices are fruitful. Practice makes perfect. And if we want teachers and students to be ready, then they need practice, practice and more practice. (What’s that fact about needing 10,000 hours at something before we can say we’ve got it?) This includes writing PARCC-like assessments, peer review and editing of tasks, student answering of tasks, and analysis of that work. With assessments in hands, engage in a refining protocol that allows teachers to present and receive feedback on the quality, clarity, and DOK of the item. Analyze content (including specific vocabulary) and skills students will need to know to respond to the item. Plan backwards from the tuned assessment to create mini-experiences and practice opportunities that will prepare students throughout a unit. 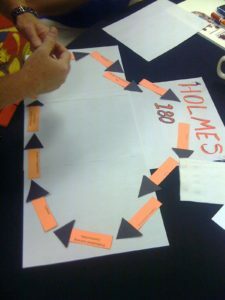 For example, if the item that’s been created requires students to watch a short video clip and gather evidence of a viewpoint, then there should be opportunities for students to practice extracting key ideas and evidence-based details from video footage that is linked to content for that unit. Analyze formative student work as evidence of whether lesson plans and practice opportunities are adequately preparing students. For example, if a teacher decides to use exit slips for students to cite textual evidence in defense of an argument, then those exit slips could be quickly sorted to determine student strengths and weaknesses with the task. Follow-up mini-lessons could be developed to build student skills accordingly. I’m curious to know what you are doing to prepare for the transition to CCSS and PARCC. Leave your comments below so we can build a bank of strategies to support one another in the cause. This entry was posted in Blog and tagged assessment, Common Core Standards, parcc. Bookmark the permalink.